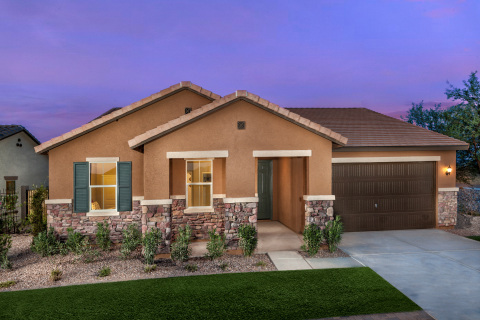 MARICOPA, Ariz.--(BUSINESS WIRE)--Sep. 4, 2018-- KB Home (NYSE: KBH) today announced that Homestead, a new neighborhood of one-story ranch homes in commuter-friendly Maricopa, is now open for sales. Situated in the established Homestead master-planned community between W. Smith Enke Road and Honeycutt Road, Homestead is convenient to State Route 347 and Interstate 10. In total, KB Home will be constructing 84 one-story homes and offering five distinct floor plans on expansive homesites. With up to four bedrooms and two bathrooms, and ranging in size from 1,400 to 2,300 square feet, the KB homes at Homestead feature desirable design characteristics such as spacious master bedrooms with large walk-in closets, covered patios, and optional three-car garages, detached garages or detached garages with a workshop. Pricing begins in the $190,000s. Residents of Homestead can enjoy the planned community amenities, including parks, playgrounds, green belts, open space, volleyball and basketball courts, and softball and baseball fields. Additionally, the new community is just minutes away from Copper Sky Park, which offers 98 acres of nearly endless opportunities for fitness, fun and leisure. The City of Maricopa Park includes softball and baseball fields, tennis and basketball courts, a skate park, interactive playgrounds, shaded ramadas with BBQ grills and picnic tables, a special event amphitheater, dog park and a stocked lake for fishing enthusiasts. The KB homes at Homestead will be built to current ENERGY STAR® guidelines and include WaterSense® labeled faucets and fixtures, meaning they are designed to be more energy- and water-efficient than most typical new and resale homes available in the area. These energy- and water-saving features are estimated to save KB homebuyers between $864 to $1,140 a year in utility costs, depending on floor plan. As part of KB Home’s distinct homebuilding process, buyers may personalize many aspects of their new home to suit their budget and preferences. After selecting their lot and floor plan, KB homebuyers can work with expert design consultants at the KB Home Design Studio, a retail-like showroom where they can select from a plethora of design and décor choices, including countertops, cabinets, lighting, appliances and window coverings. The Homestead sales office is located at 40775 West James Lane in Maricopa. The sales office is open Tuesdays through Sundays from 10:00 a.m. to 6:00 p.m. and on Mondays from 2:00 p.m. to 6:00 p.m. For more information about Homestead, or KB Home’s other new home neighborhoods, visit www.kbhome.com or call 888-KB-HOMES.